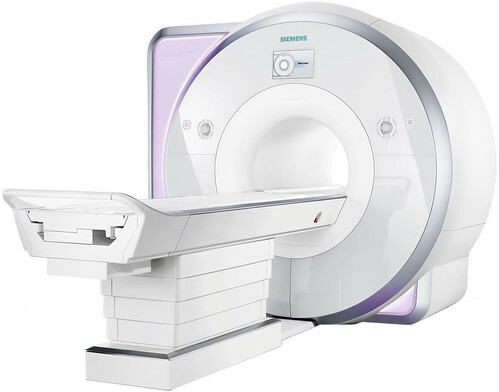 Magnetic resonance imaging (MRI) scanners use strong magnetic fields and radio waves to produce a picture of your brain. The scanner looks like a large tube with a hole in the middle. Functional MRI (fMRI) scans monitor brain activity by detecting changes in blood flow in the brain. WHAT HAPPENS DURING AN FMRI SCAN? During an fMRI scan you lie on a bed, which slides into the hole in the scanner. The scanner is controlled by a technician in a different room. You can talk to the technician at any point during the MRI scan through an intercom. The technician will also be able to see you on a monitor throughout the scan to make sure you are okay. The MRI scanner will regularly make loud noises. These noises are perfectly normal and are the result of the electric current in the magnetic coils being turned on and off. Since MRI scans can be quite noisy, you will be given some earplugs or headphones to wear throughout the scan. During an MRI scan we take lots of pictures of your brain. It is therefore really important for you to stay as still as possible during the scan so the pictures aren’t blurry. We will give you a pillow to help keep your head still. When you are in the scanner, we will ask you to complete a computer task. You will be able to see a computer screen in the scanner. We might ask you to just look at the screen while we show you some words or pictures, or we might ask you to press a button when you see certain words or pictures. These tasks allow us to see which parts of your brain are involved in emotional processing and decision making. Yes! fMRI scans are painless and safe. CAN ANYONE TAKE PART IN YOUR FMRI STUDIES? Most people can take part in our fMRI studies. However, individuals that have a pacemaker fitted or have any metal in or on their bodies are unable to take part. We also recommend that individuals with claustrophobia do not sign up to take part in an fMRI study. Participants in our studies need to be native English speakers, right-handed and free from current psychological and neurological diagnoses. Participants also need to have normal hearing, and normal, or corrected-to-normal, vision. You must be able to see clearly at an arm’s length without wearing glasses. You can wear contact lenses in the scanner. Before taking part in our fMRI studies, we will ask you to fill out a questionnaire about your family and medical history to make sure it is safe for you to take part. HOW DO I PREPARE FOR AN FMRI SCAN? There isn’t much preparation for an fMRI scan. Since MRI scanners produce strong magnetic fields, you will need to remove all metal from your body before having a scan. All watches, jewellery, piercings and dentures will need to be removed. In addition, please wear clothing without metal zips, buttons, fasteners, belts, buckles and underwires for bras.